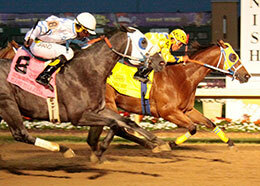 Heart Of The Cartel sired his first stakes winner on Saturday at Indiana Grand Racing and Casino. WAYNE, OK—JULY 8, 2018—Third-crop sire Heart Of The Cartel got his first stakes winner on Saturday when Tres My Heart won the $50,000 Indiana Grand QHRAI Derby at Indiana Grand Racing & Casino. Tres My Heart, making only her second career start, had a clean break from the gate and seemed focused from the start. The 3-yaer-old Oklahoma bred filly grabbed a short lead and became the horse that the rest of the field would have to catch in the final portions of the race. She completed the 400 yards in :20.020 seconds to pick up the winner's check of $27,500. Trainer Hector Sanchez conditions the bay filly for owner Maria Chaparro. Canadian River QH's LLC bred Heart Of Cartel from the Tres Seis mare Famous Mariah. In just her second career start, Tres My Heart wins the $50,000 Indiana Grand OHRAI Derby. From a limited number of only 4 starters he has sired 50% winners with average earnings per starter of more than $18,500. Heart Of The Cartel's top performers include aforementioned stakes winner Tres My Heart SI 88 (winner at 3, 2018 $27,750, Indiana Grand QHRAI Derby), Htr Miamor Tequilla SI 98 (e wins to 3, 2018 4th Oklahoma Derby-G3), Heart To Be Famous SI 81 ($2,150 at 2), etc. A son of leading living sire Corona Cartel, Heart Of The Cartel won two of six starts before retiring from the racetrack. He is out of the stakes-producing Streakin Six mare My Streakin Heart, dam of 13 ROM including Mile High Derby winner Agillion SI 103 (7 wins, $93,288), All American Futurity(G1) finalist Have A Coronary SI 93 ($71,625), Streakin Valiantly Si 92 ($10,608 at 2), etc. The second is the Raise Your Glass Thoroughbred mare Keeper Of My Heart, a half-sister to stakes winners Mink And Wine ($145,317) and African Mink. She is the dam of 4 QH ROM including G2-placed winner Glass Hearts SI 108 ($43,251), Rainbow and Kansas Futurity(G1) finalist Heart Streaker SI 98 ($48,926), etc. Keeper Of My Heart is the grandam or great-granddam of champion filly First Regards SI 99 ($277,270), G3 winner Legacys Heartbeat SI 98 ($164,365), G2 winner More Heart SI 95 ($153,199), G1 winner Wealth ($133,150), stakes winner and G1-placed Regard ($100,486), stakes winner and multiple stakes sire Chicks Regard SI 107 ($52,783) and stakes-placed G1 finalist Apollitical Stone SI 90 ($98,688 at 2, 2017), etc. This is also the family of Thoroughbred stakes winner Commitisize-G2 ($784,887), Buffalo Man-G3 ($505,234), Rust Spur ($281,202), Perfect Six ($278,255), Explode n'Win ($213,690), etc. 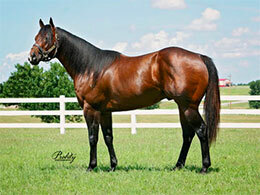 Heart Of The Cartel stood for a 2918 fee of $1,500 at Royal Vista Ranches near Wayne, Oklahoma. For additional information or breeding contracts contact Laura Wipf-Erickson at 405-449-7575.